Modern, second floor apartment in five star complex, very close to the beach. Walking distance to all amenities and suitable for families or couples. Brand new one bedroom apartment in the idyllic area of Protaras resort center. The property can sleep up to 3 people as the living area has a sofa bed. 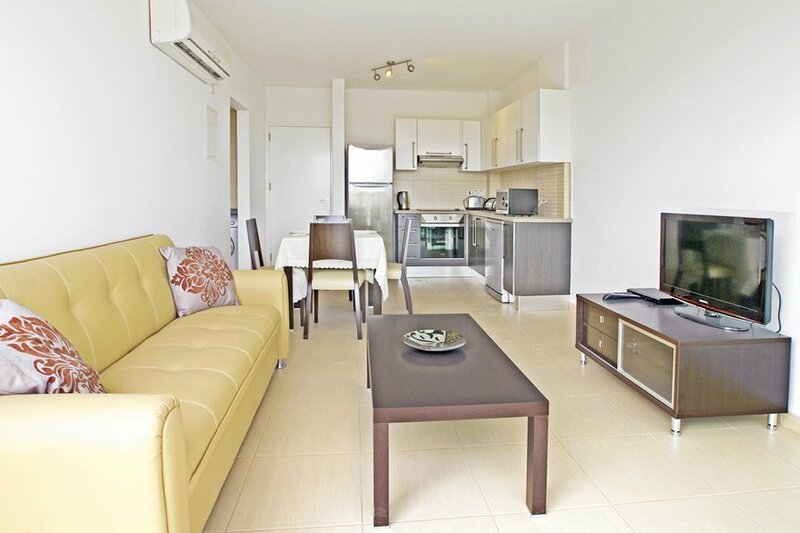 Bob Apartment is situated in a self-contained complex offering 5 star facilities including a tennis court and 2 large communal pools and 1 baby pool. Being air conditioned throughout this spacious one bedroom apartment is is the perfect choice for your holidays in Cyprus. The apartment is situated in a prime location of Protaras, 200 meters from the beach on the second floor of a small tourist complex. Located less than a minutes walk to the streets filled with shops, bars and restaurants, to suit all tastes and ages. The site hosts tennis court, two outdoor pools and a children's pool that can be used free of charge by our quests. There are also sun loungers that can be used by our quests free of charge and gym and spa (extra charge). The apartment is fully furnished and equipped with all modern appliances such as TV, DVD player, kitchen: fridge/freezer, cooker, microwave, toaster, kettle, dishwasher, washing machine, ironing facilities, oven, extractor fan & all cooking utensils. There is toilet/shower room.